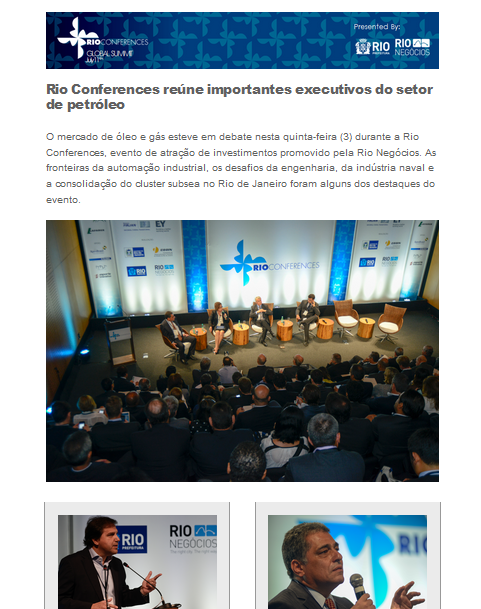 Amid the World Cup, Rio Negocios promoted Rio Conferences, a series of five sectorial conferences that brought together executives from companies with global operations, Brazilian and foreign business leaders, financiers and government officials to discuss new investment opportunities in Rio. Performed at the Museum of Art Rio (MAR), the conferences dealt with issues relevant to the city’s economy: Health; Technology; Infrastructure; Audiovisual and Oil and Gas Sectors that Rio has more competitive than other markets. The Global Investment Summit ended the series of conferences with discussions on international trends and the role of Brazil in the global scenario. Altogether, the Rio Conferences received 2,200 inscriptions from 30 countries, including 500 companies and 95 speakers. In these meetings, the city showed its potential to attract investments transformers. The event had such positive results that it is already managing a new investment promotion event during the 2016 Olympics. Cloud & security, analytics, social & mobility: experts discuss the main aspects of the ICT market. The frontiers of industrial automation, the challenges of engineering, shipbuilding industry and the advancement of sub-sea market are on the agenda of this unique seminar.